When looking at your backyard and the design of it, it is nice to take a look at the flow and what you want to do with your backyard. 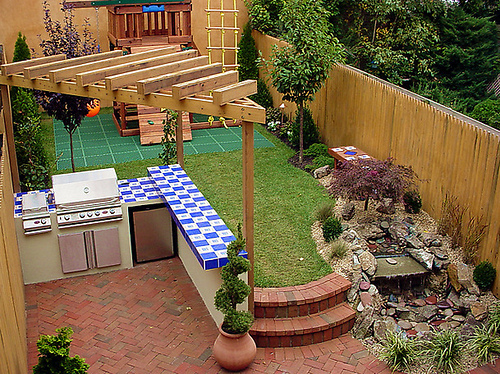 This will help you establish a way to make your backyard functional, beautiful and engaging. Dividing your outdoor areas for different purposes can help you manage how to use your backyard. Understanding your backyard dimensions is important to establishing your plan. The size of your backyard and the type of environment is key to developing your backyard strategy. The size of your yard may limit what you can design and the environment might be best for certain types of plants or trees as well as materials. For instance a very dry hot place might be able to grow cactus. While a very cold place might grow evergreens and holly trees. Once you have the basics of your dimensions and environment, now it is time to identify your needs and wants. What kinds of sitting areas or play areas do your want in your yard? Do you entertain frequently and if so, for how many people? Is a relaxing area for coffee in the morning important? Or does a family area where you can play horseshoes, croquet or bocci important? What design style are you most interested in for your backyard? Once you have defined your wants and needs, you must prioritize these wants and needs. Once you have completed this task of prioritization, it is time to start defining the outdoor space. Do you like to cook outside? And if so, you will need to determine the size of your outdoor kitchen or grill area? How will your kitchen operate? Identifying whether you will need to pipe in propane or use a charcoal grill is important to any outdoor kitchen construction. Once you have the outdoor kitchen established, defining a location to eat is another area that will require some space. Your backyard is starting to show each different areas. Do you want a table and chairs? Is having a bar area by your indoor kitchen important? Or do you want a sitting area with chairs but no tables. Understanding all the members of your family will help you identify play areas for children and running areas for pets. You will also need to think of private areas for some peace and quiet when the time is required. Also taking into account the type of play areas you want to provide for your children and pets may limit the size of other areas in your backyard. So it is important to plan out your yard to incorporate all these details. In addition to food and eating areas and play areas, understanding if you need space for other components in your back yard will also need space. Components like HVAC units, pool equipment, storage of gardening equipment, space for trashcans and storage of sporting equipment or recreational vehicles will need space for storage and operation. It is important to incorporate these items into the layout of your backyard. Once you have your plan outlined, it is time to start your construction of the project. Identifying the materials that you would like to use, the equipment you need for the project and finally the plant material that will be added once your hard scape is completed will occur as part of the construction process. These are great tips. I’ll keep them in mind as we plan our backyard space this summer/fall.